If you are the sort of person who says "goes on a bit doesn't it?" when a song stretches beyond three minutes, this probably isn't for you. 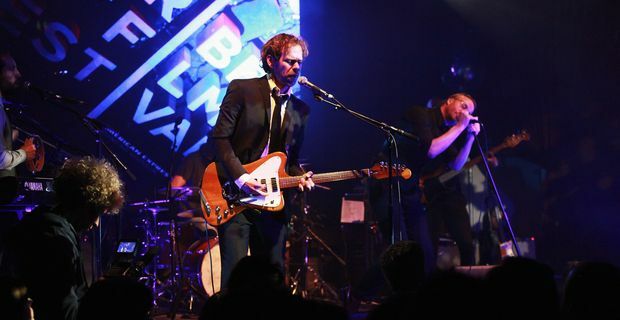 American indie rock pioneers The National are going to play their song 'Sorrow' at the Museum of Modern Art on Long Island for a relentless six hours straight. Those familiar with the High Violet album will point out that the recorded version of 'Sorrow' lasts a conventional three minutes and 25 seconds. This is art though, a collaboration with Ragnar Kjartansson for a performance piece called, wittily, A Lot Of Sorrow. If that sounds like an ordeal, the museum begs to differ. "By stretching a single pop song into a day-long tour de force, the artist continues his explorations into the potential of repetitive performance to produce sculptural presence within sound," their explanation suggests. "The idea behind A Lot Of Sorrrow is devoid of irony yet full of humour and emotion. It is another quest to find the comic in the tragic and vice-versa." "Day-long" means in the artistic sense: from midday to six pm. "Finding the comic in the tragic" is a reasonable description of the music of The National. 2013 could be a landmark year for a band that has become steadily more popular and influential over the last decade. Their new album, Trouble Will Find Me, is released on May 20. According to frontman Matt Berninger, it deals with themes of death, but not in a morbid way. "It's a record about getting older and all the fascinations and headaches that go with that," he told NME. "But it's not grim, honestly. It's actually pretty fun." UK fans unable to make it to MOMA can catch The National on a UK tour in November, with extra London dates added due to demand. Song lengths at the live shows will probably be marginally more conventional.